Once you have decided to migrate from Flash to HTML5, the next question is, do you do the process in-house or outsource it to an eLearning vendor? In this post, we will take a look at the myriad of benefits that outsourcing can give you. You will get a qualified team of experts to handle the process. Outsourcing the Flash to HTML5 migration process can open the doors to a larger pool of resources. An eLearning vendor with the right expertise, experience, and team strength can help you choose the correct solution to convert courses into a future-friendly format, and ensure efficiency by providing cost-effective solutions and top quality outputs. Such a vendor can also handle eLearning modules with varying complexity levels and intricate functionalities, and can deliver on complex requirements. This is also applicable especially if you have a large repository of legacy courses requiring migration. Considering the sheer volume of content in such instances, outsourcing is your best option given the time, proficiency, and effort that is involved. You will have access to cutting-edge authoring tools. Another advantage of choosing an external vendor is the vendor’s experience of working with multiple authoring tools, each of which may have the ability to fulfil distinct requirements of each eLearning module or project. You can save on time and money. Choosing to get the migration process done through an in-house team isn’t feasible, considering the costs involved in acquiring the expertise and tools that you might not have. Hiring resources, and training them as well as your existing resources, is a pricey endeavour both in terms of money and time. On the other hand, if you outsource the conversions to an eLearning vendor, your organization will gain access to a pool of resources like graphic designers, programming experts, Instructional Designers, etc. who already have the required skills. Additionally, you can choose among the various alternatives offered, thus being able to customize the conversion process depending on how much you can spend. You will reduce turnaround time. Considering these factors, outsourcing to the right vendor can not only help you save money but also a massive savings on time, thus providing you opportunities to reduce the expected turnaround for your Flash to HTML5 conversion projects. Thus, choosing an external vendor could make the transition seamless as compared to an in-house team that could face teething problems in the form of initial delays and confusion till they actually get a hang of the whole process and finally settle down to provide a solution. You will have access to a strong testing environment. A robust testing process is another important aspect of conversion. Access to a strong testing environment is one of the advantages of going for a vendor to do the job for you, since they already have the setup required. This is especially crucial at a time when the BYOD movement is picking up rapidly in most organisations, where learners are using many different types of devices, including smartphones and tablets, with different configurations, to access their eLearning content both in their offices and on-the-go. You can enhance existing training programs. Fresh eyes from external vendors that take a look at your legacy courses can also provide insights about the design and look and feel of your courses. So when they are re-developed in HTML5, the vendor’s team can provide a different perspective on the course aesthetics, thus enhancing the eLearning content delivery. An in-house team may only end up focusing on the effective conversion of Flash to HTML5, and not much attention might be paid to find ways to enhance the courses’ effectiveness. Migrating your Flash-based courses to HTML5 is imperative, Flash will soon be history. As we just saw, an external vendor has certain distinct advantages to do the job over an in-house team. Compare these factors with the effort you might require to complete the process in-house and take an informed decision. 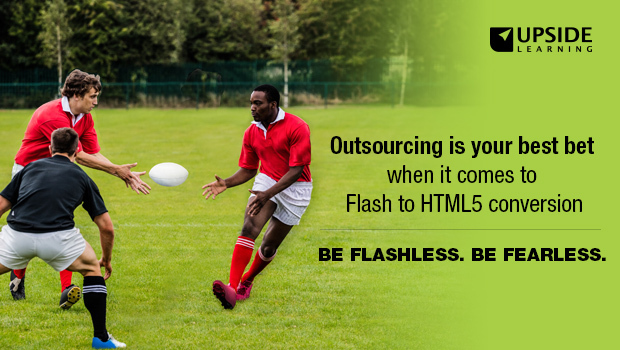 The paybacks of outsourcing Flash to HTML5 conversions are seminal and it is definitely worth a try.